Enjoy The PEACE & ZEN of a clean Scum-Free Tank! “Look at my tank! It’s so clean! Absolutely no green stuff!” M.G. “Holy (Explicative)! Does this stuff work on water troughs!” Carol E.
​”Love this stuff! It works!” Vicki R.
Also safe and easy to use with tank heaters! Who likes dumping and scrubbing slimy, green stock tanks? If your stock tank looks like it’s growing a habitat for the cast of “Finding Nemo” then you know how nasty that chore can be. If you own or work on a ranch or stable or boarding facility and you have lots of stock tanks and automatic waterers then you know how time consuming that chore can be in the heat of the summer…Really you could be out riding. What if you could fill your stock tank with fresh water, put a 100% natural mineral into your water, and it magically stops green algae from growing for up to 3 weeks? And then all you have to do is dump your water and refill, NO SCRUBBING! Get rid of your slimy green tank scum, and add valuable trace minerals to your horses water. 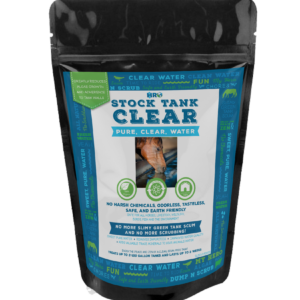 Stock Tank Clear leaves yours horses water, sweet and pure, and improves water quality. Its 100% safe, non-toxic, natural, organic, odorless and tasteless. Other stock tank additives contain chemicals, or if enzymatic, can take up to a month to work! Others have to be tied into the tank so curious horses don’t pull it out and play with it, or come in huge tabs not suitable for small tanks or things like chicken waterers, or dog bowls. Stock Tank Clear is even safe for all aquatic life, so if you like gold fish in your tank, it won’t hurt them. It’s safe for all wildlife, exotics, and fowl. It’s safe and easy to use in automatic waterers and even with tank heaters. Stock Tank Clear can even be used in ornamental ponds and bird baths.